The most common tumor located within the third ventricle is the colloid cyst. This benign tumor can cause a blockage of cerebrospinal fluid (CSF), leading to increased intracranial pressure and potentially death. The definitive method for treating colloid cysts is surgical removal. Prior to the advent of endoscopic neurosurgery, Most colloid cysts can be removed via a craniotomy, an open microsurgical procedure. Because of the deep and central location of these benign tumors, this surgical procedures can be lengthy. Memory function is particularly at risk. Highly refined endoscopes with a wide array of compatible instruments allow drainage and/or complete removal of some colloid cysts through a less invasive technique. 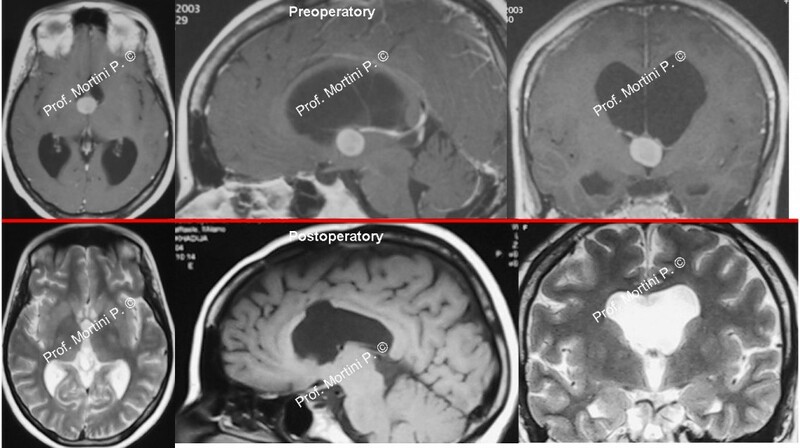 Treatment of hydrocephalus may require a ventricular shunt, despite successful colloid cyst resection. The procedure is performed through a small incision (approximately 1 inch) behind the hairline. From this site, the endoscope is inserted into the ventricular compartment of the brain and then navigated toward the tumor surface. The wall of the tumor is then coagulated with an electrical current and the cyst is then opened with sharp dissection. A variety of suction catheters are then used to empty the contents of the cyst. The cyst wall is then removed and any remnants are destroyed using an electrical current. The endoscope is then removed and the wound is closed. The procedure averages 45 minutes-1 hour and patients can return home within 1-2 days.